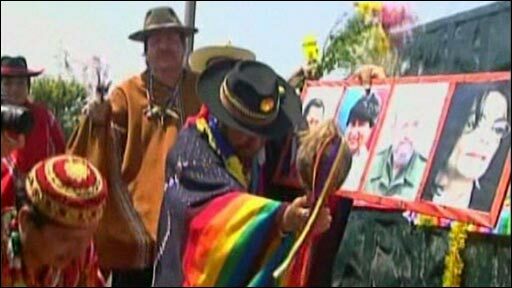 Peruvian shamans met at Lima's highest point on Sunday to perform a ceremony which they believe will help protect the spirits of world leaders in 2009. Fidel Castro, Hugo Chavez and Barack Obama were among those leaders chosen to receive special attention. It was predicted that President-elect Obama would have a good start to 2009, but that Venezuela's leader Hugo Chavez would have a "quite a bit of desperation" this year. Despite lacking world leader status, Michael Jackson also received special note with healers saying "he would get stronger" in the coming year.